Being cooped up inside or stuck in the office all day can really take a toll on the body. When the sun comes out you’ll find you just can’t help yourself but to go outside to soak up the rays. Or just sit out on the deck for a coffee. As a big man myself, I know it can be difficult finding a suitable sitting station. So I’ve gone out and researched what I think are the best Outdoor Chairs For Heavy People. Including beach chairs, chairs for the pool, garden chairs and stunning outdoor deck/patio chairs with large weight capacity ratings. Chairs for all kinds of outdoor activities. Within this article you can find links to other pages with more chairs suitable for heavy people. So if you have a particular style in mind, click on the relevant links to see more options. Lately I have been coming across more and more Phi Villa furniture. But it wasn’t until I saw these beautiful patio chairs that I really took notice. I don’t know much about the company as I think they are relatively new, but they certainly look like high quality furniture. These extra wide patio chairs by Phi Villa are ideal for the larger person. They have a huge seat and is completely padded. I generally don’t buy too much furniture that’s not padded as my oversized body disagrees with hard surfaces to sit on. So these chairs come in a set of 3, which includes the outdoors table. There are two variations of this chair set. One set is a rocker style of chair and the other pictured on the right is your more traditional patio chair. The patio rocker has a 350 lbs weight capacity, while the other set has a 300 lbs capacity. 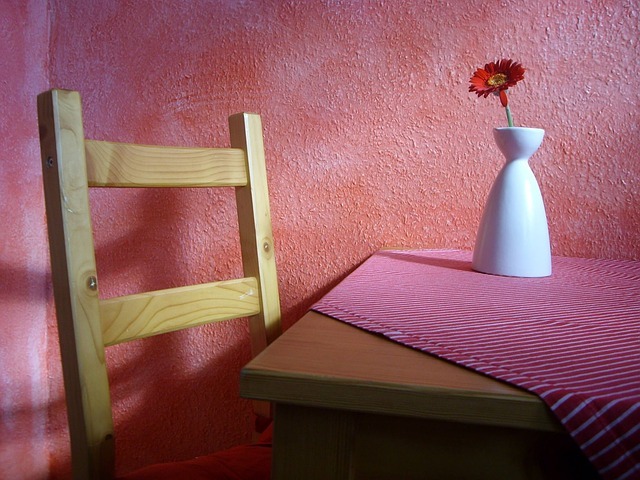 Both styles of chairs are available in beige or red. While the spring rocker type of patio chair has a higher weight capacity and a wider seat, I prefer the more stable base foundation. However, if you want to check out the Phi Villa 350 lbs rocking patio chairs you can check them out on amazon here. While these more traditional patio chairs don’t rock, they do recline. Only two positions but that is enough for me. I really like how the chairs are made for the outdoors. The steel frame is powder coated to resist rust from water while the padded cushions are UV resistant. Do note the padding is attached to the chair. So you can’t remove it. However you can scrub them down with soapy water and a hose as the fabric is meant for the outdoors. It won’t go moldy on you. For more choices visit our heavy duty patio chairs. 29.1 inches deep with a 300 pound weight capacity. Probably the most common outdoors chair is the humble camping or beach chair. There’s no better way to enjoy the outdoors then down at the beach or camping with a few friends. Having the confidence in your chair is absolutely the most important ingredient for having a good time out in the sun. Support, confidence and comfort are what I look for in any chair. Get more details on the top beach chairs before Summer arrives. The industry leader in my opinion when it comes to maximum weight capacity. This king Kong outdoors chair can withstand a mammoth 800 Lbs!. Just look at the support beams. Who doesn’t love a gentle rock out on the deck admiring the silence and backdrop. I know I certainly do. It’s a great place to chill out and read a book. With rockers it’s critical that you adhere to the rockers weight capacity. This is because the constant strain and pressure on the chair from the rocking motion. To help you find the right rocking chair for you, we have researched a few outdoor rockers sorted by weight capacity. 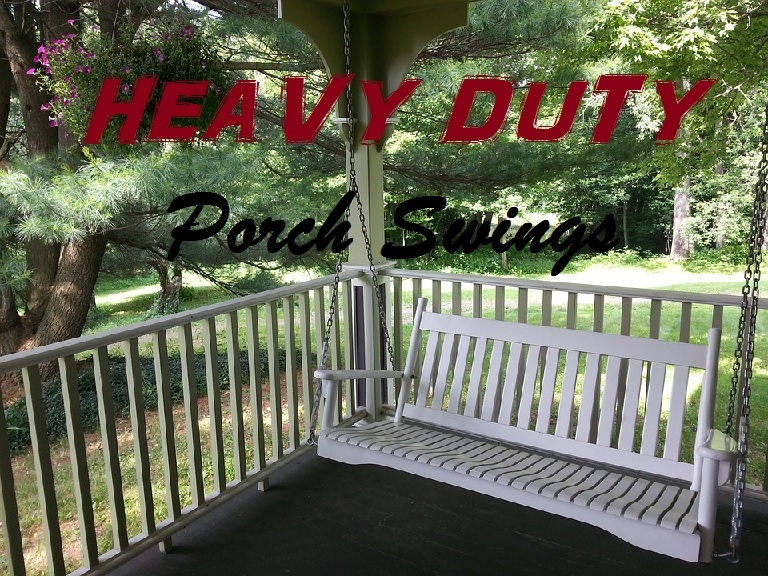 To see more options, visit the heavy duty outdoor rocking chairs section. Firstly, this rocker is a good choice in terms of catering to the heavy Man. It's a rocker that can withstand up to 600 pounds. Which is quite impressive for a rocker. Made from recycled materials this rocker not only feels amazing but is also helping the environment. The seat is rather large and appears quite comfy. The chair comes in an assortment of colors so it can also be an interior rocker during the colder months without looking out of place. Top 2 reason's I love this rocker! 1. It's not made from timber, so therefor maintenance is not existent. Say goodbye to sanding, oiling sanding oiling year after year. 2. It's incredibly sturdy and durable. The strong build of this easy to put together rocker speaks volumes from numerous reviews. For an outdoors rocker to last in the elements is simply incredible. My hot tip for outdoors rockers for plus size people. These chairs are multipurpose XL folding chairs for us bigger guys. They are great for BBQ’s, around the outdoors picnic table or just for casual sitting. An essential chair for us heavy people to have on standby. Here are a few outdoor folding chairs with large weight capacities. A folding chair can be used for so many occasions. So buying one for one specific need is often not the case as you will find countless ways to use it. 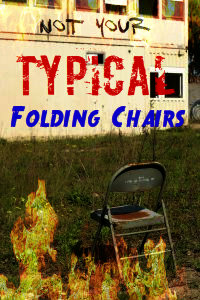 For more suitable choices visit out section on folding chairs for heavy people. You come to expect some squeezing of the hips from the arms on these types of folding chairs. This may not be the case here. The seat is well and truly wide enough to cater many in the plus size community. This chair can be a little pricey, but what I've come to accept throughout the years is that: For us bigger guys, we have to pay more to accommodate the extra reinforcements required to make these chairs be able to handle the load bearing. Which to me is confidence. Confidence in my chairs ability to hold my weight. While these bulk buy types of folding chairs may not look a million dollars. They still do the job. They boast high weight capacities and look to be durable and stable which with any luck could survive many years of outdoor sitting. Honestly I don’t have a problem with them around my table. Whether that’s indoors or outdoors. For the budget minded folks, these chairs are your best bet. You get 4 of these fabric padded steel framed folding chairs in one bundle. 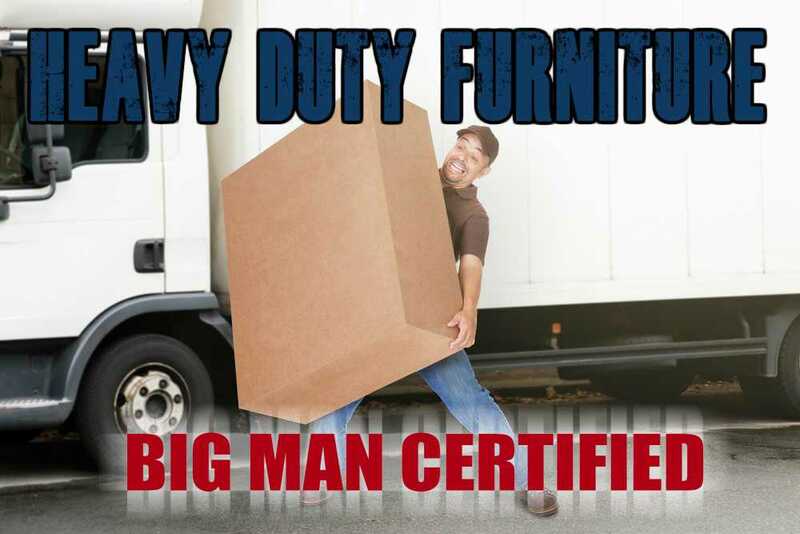 Rated to hold 480 Lbs and made from good quality materials. These chairs are great for bulk buy for parties, weddings or Birthdays. But they are also adequate outdoors folding deck chairs. Want to be able to sit out by the garden and breath in the fresh air, but have never found a suitable garden chair that can withstand heavy capacities. Your not alone. While I don’t particularly have a green thumb so to speak (that’s my Son’s Job), I absolutely love to sit out among nature and escape the day to day realities that we call life. Here’s a few outdoor garden chairs for us plus size people. I love the idea behind the Any Size Bench. What it is, is a cheap way to get a garden bench. All you have to do is provide the 2x4 lumbar and screw it into the pre-made holes with the provided screws and voila. You got a DIY work bench. While not everyone is a handy man (even tho it is really simple to assemble, just drilling some screws in), one could always hire a handyman for an hour to put it together and you still get a rather cheap bench. This set is a top idea for the entertaining area or garden. As it is claimed to be 100% weatherproof (Made from 100% Polyester which is resistant to water, wind and the harshest of environments) you will find yourself spending a lot of time outdoors. Whether it to just sit on the 500 Lb capacity love chair with that special someone or to entertaining guests by the fire. The positive factors towards this outdoors set are that fact it's weatherproof, 500 pound capacity, very sturdy, quality and pretty darn comfortable. However, this piece of back yard magic, doe's need to be assembled. While it is pretty straightforward to assemble, it's still worthwhile mentioning for those that don't like the challenge of following instructions. Or you could always pay the neighbor $50 to put it together. Adirondack chairs are a unique style of chair that make for great outdoors seating. But sometimes they can sit too low to the ground and not have the structural design to hold a heavier person. So many big people choose to avoid sitting in one. But I think every chair deserves a chance, especially if its built to handle higher weights and larger bodies. Which is why these heavy duty Adirondack chairs make for superb outdoors chairs. They are big, tough and most of all, they are stunning pieces. So you want more?. Of course, don’t we all. Ok, so there’s a few more outdoor chairs available to us heavier folk. These chairs are a little different in their own ways. Different but still very stylish. I could easily have all of these chairs out on my back patio, if the Wife allowed it of course. But I do think I’m starting to sway her towards the ‘Dream Chair’. 2 Inch thick spun Polyester (Weatherproof) is what makes the Dream Chair seem like your floating on a cloud. I love the unique design, it's like being on a hammock, but with the feeling of more support. The built in canopy is a real nice touch. Especially if you know exactly where you want to put this chair, all you have to do is set it up in the opposite direction of the sun and your laughing. Oh it's also available in many different colors to match many styles and decors. But Think Its TOO Hard To Assemble? WRONG! If your anything like me and just by the sight of the Dream Chair you quivered in your chair from the thought of assembling it. Well don’t be. My Wife kindly pointed me in the direction of this video on how to assembly the Dream Chair. Now I guess that means we are getting one. Or maybe 2, who knows! So this chair by DC America could have fit into many categories, so I just added it down here because it really is a unique chair in it’s own league. It’s one of my personal favorites chairs for outdoors only tho. Although I do advise you to invest in a nice comfortable cushion because after long sitting periods you tend to get the pattern from the metal on the backs of your legs. However it’s a really comfortable chair that can also rock by its springs (see picture), it just looks fantastic and it shouldn’t rust on you. Which is what we want from an outdoors chair. *Heavy Duty Wrought Iron - What we want! For anyone big or small looking for a new pool chair, then I recommend the Caravan Canopy Oversized Zero Gravity Recliner. It’s an ultra tough hard wearing rust resistant work of art. Ok so maybe I went a tad overboard. But you get the picture. It’s a super strong chair with double thick stitching and can hold up to 330 lbs. Not the biggest chair by any means but still it’s definitely one of the nicer pool chairs going around for the larger people. So I hear grey is the ‘in’ color for 2016, maybe so. I’m not that much of a decorator. Anyways, point being this chair comes in the grey variety as well as other colors. So if grey turn’s out to not be the new color for 2016, then we got options. *You can lay in the 'Zero Gravity' position - Which is the most relaxing position known to man as it supports the best blood flow, relieves stress to the heart and has virtually no stress on the muscles, joint, bones etc. Hi. Looking for black or dark green furniture for front porch. The Mainstays Stanton set of love seat, two chairs and table with red cushions would do OK but we already have a glass topped black wrought iron table. I fell in love with the DC America Charleston black wrought iron chair but it’s out of stock — everywhere. I’ve found some affordable black wrought iron rockers to accompany a chair for my husband, Mike, but I need to find a chair for HIM! There could be many choices but we’re on retirement incomes and need something low-ish in cost. ALSO, we have a really picky HOA. The really affordable resin rocker is just too — UH — cheap looking for the front porch. Do you know of ANY other wrought iron chairs? I’ve checked a lot of sites and have found chairs to 300 LBS and even benches to 350. 350 would handle his weight, although I’d like a chair which could handle 400 LBS for a margin of safety. Do you have any additional suggestions?? Hi Carlie, the DC America wrought iron chair certainly is in a league of its own. I hope that they do become in stock for you soon enough. I looked around and couldn’t find anything similar with a weight capacity of 400 pound which is a shame. Hopefully another reader can lead you in the right direction?. Looking for a resin chaise lounge with adjustable back for use at the pool. Weight capacity 290. Any recommendations? Hi Kathleen. I’ve had a quick look around. It’s not easy getting weight capacities on these. However, I did find one that states in the comments for the product: “The Omega Lounge is rated for 150 kilos (approx.. 330 lbs.) via ENI Testing”. They are Italian made and come in a set of two. You can find them on amazon here. I will keep an eye out for more. Hi, looking for a outdoor chair with a 400 lb – 450 lb weight capacity.